Mauna Kea Volcano rises high above the landscape on the north side of Hawaii's Big Island, stretching 13,796 feet (4205 meters) above the beaches along the Kohala coast. Massive Mauna Kea is the tallest mountain in the world, towering 33,476 feet (10,204 meters) above its base on the floor of the Pacific Ocean. By comparison, the elevation of Mount Everest is 29,029 feet (8,848 meters) above sea level, making it the highest mountain on earth. Mauna Kea is over 1 million years old. Even though the last eruption is estimated to have occurred something like 4500 years ago, it is not considered extinct. It is a dormant volcano, meaning there is still a possibility that it will one day awaken and erupt again. Recent earthquakes beneath Mauna Kea Volcano might signal an impending eruption, although earthquakes are not always indicative of that. Scientists do believe that another eruption will occur at some point in the future. Continuous monitoring of subsurface activity takes place with seismometers and a single GPS receiver (operated by NASA's Jet Propulsion Laboratory) on Mauna Kea itself, as well as instruments on Mauna Loa to the south and Kohala to the north. Like all Hawaii Island volcanoes, Mauna Kea is a shield volcano. Shield volcanoes are generally large and wide with broad, gently sloping sides. The summit of Mauna Kea Volcano shown in the image below is a perfect example of a shield volcano. The shape is due to the fluid lava that flows gently and smoothly across long distances during an eruption, accumulating in broad sheets and layers as it cools. Because shield volcanoes are most prominent in the Hawaiian chain, this type of eruption is also known as a Hawaiian eruption. In Hawaiian, Mauna Kea is actually a short version of Mauna a Wakea. Wakea is the sky father, so Mauna a Wakea is the mountain that belongs to the sky. It is usually interpreted to mean White Mountain because of the snow that is often visible at the Mauna Kea summit. 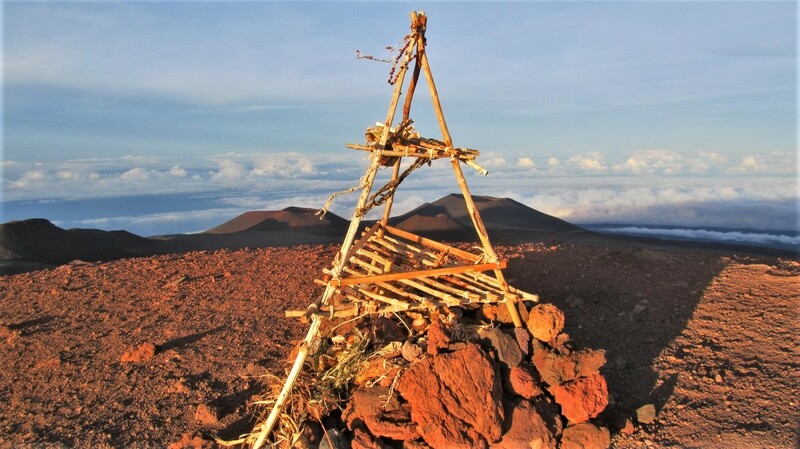 Mauna Kea is sacred in Hawaiian culture. If you are planning a trip to the top, prepare for cold. Even when there isn't snow on the mountain the temperature can be 40 or more degrees cooler than at the beach. Know before you go. The road to the top is closed often due to snow and high winds. 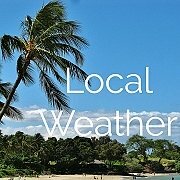 To check current conditions visit the Mauna Kea Weather Center. 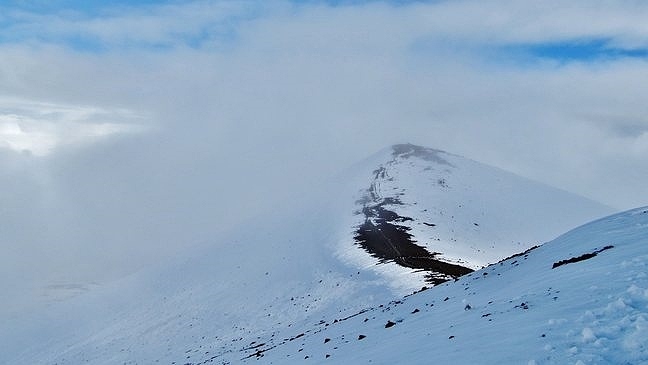 A short trail of approximately .3 miles (.5k) leads from the top of the summit road to the actual summit of the Mauna Kea Volcano. Views up here are spectacular. Be prepared for high winds and cold temperatures. A somewhat more challenging option is a hike to Lake Waiau located at an elevation of 13,025 feet (3,970 meters). 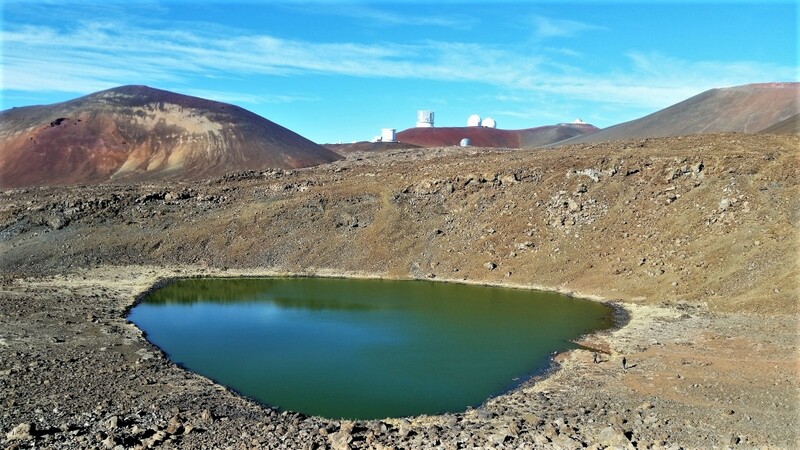 The easiest route for hiking to Lake Waiau begins approximately 2 miles below the Mauna Kea summit. Hikers should be in good physical condition, have adequate hiking shoes (no sandals) and wear warm clothing. From the ridge above the lake it is possible to see some of the telescopes at the Mauna Kea Observatory. 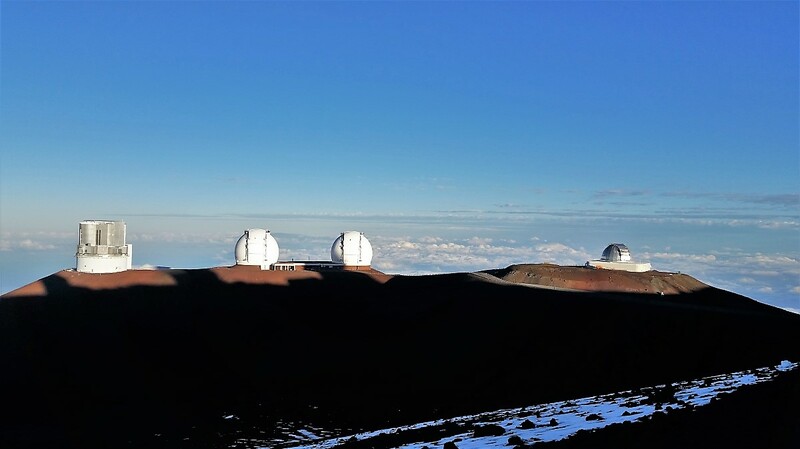 The Mauna Kea Observatory is second to none, with more than a dozen giant telescopes focusing on deep space. If the altitude doesn't take your breath away, the view certainly will! The air at this elevation is clean and crisp, making for impressive views in all directions. 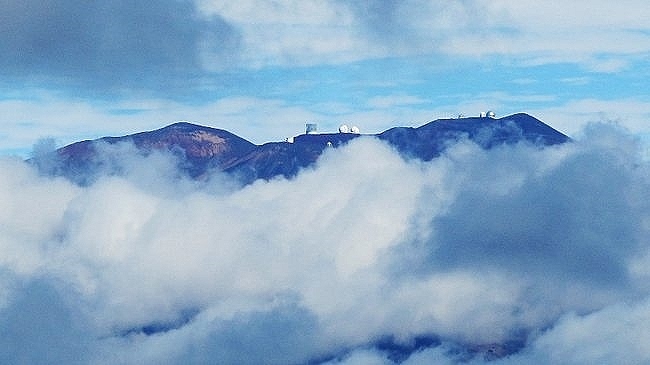 The image of the Mauna Kea Observatory in the photo below was taken from high on the slopes of Mauna Loa, about 20 miles south of the Mauna Kea summit. Certain Hawaii volcano tours should not be missed. 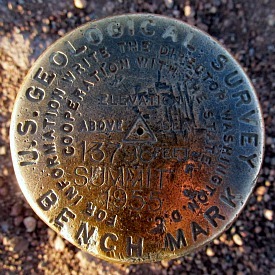 The Mauna Kea Summit Tour is one of those special tours. 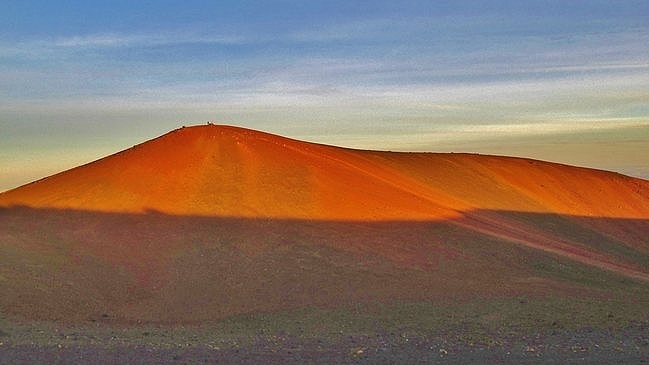 Travel in the comfort of a luxury SUV to the top of Mauna Kea, see the impressive array of telescopes and enjoy out-of-this-world views from nearly three miles above the ocean. On the way to the top you will stop at the Onizuka Center for International Astronomy Visitor Information Station. This is an important stop to begin adjusting to the extreme altitude. The visitor center has a wealth of information and videos highlighting the volcano, the Mauna Kea telescopes, and a nice gift shop. Light snacks and drinks provided before continuing to the top. It is possible to drive to the Mauna Kea summit and Mauna Kea Observatory, but the 7-mile road past the visitor center can be treacherous! It's extremely risky without a 4-wheel drive vehicle. The road is rough, steep and unpaved in sections. Don't risk losing your brakes during the steep descent without the added benefit of 4-wheel drive. Most rental car companies expressly forbid their cars being driven on the Mauna Kea summit road. Visiting the Mauna Kea Observatory is one place you're really better off joining a Big Island volcano tour. Even if you are driving your own car, it's a good idea to stop at the Visitor Information Station long enough to begin getting acclimated to the high altitude. Remember, the air is much thinner and it is a shock to the body to travel suddenly from sea level to nearly three miles high! 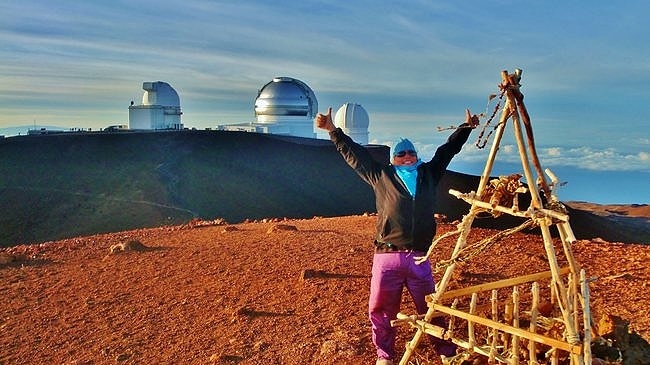 Altitude sickness is an all too common problem among visitors to the Mauna Kea summit. Drink plenty of water, and hang around at the visitor center for at least 30 minutes before continuing to the top. On top, there is a short but steep path leading beyond the parking area to the actual Mauna Kea summit. If you're up for it, this walk definitely will take your breath away. Otherwise, wander around and enjoy the impressive array of Mauna Kea telescopes, and stick around for an out-of-this-world sunset! At nearly three miles high, sunsets up here can be quite dramatic. If you decide not to go all the way to the top, on a clear day the drive along Highway 200 crossing the Humu'ula Saddle (the Saddle Road) offers fabulous vistas of both Mauna Kea Volcano to the north and Mauna Loa Volcano to the south.